Writing is often seen, and used, as a healing process for people who have endured traumatic experiences in their lives. By expressing what they have been through on paper, it has been found that this enables people to process what has happened to them and start to move forward. 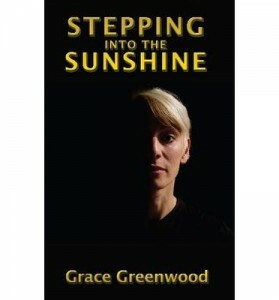 Stepping into the Sunshine is a collection of poetry which reveals the traumatic experiences of poet Grace Greenwood. Greenwood shares her journey through two successive abusive relationships, the aftermath and her first tentative steps to finding herself again. She holds nothing back, sharing her darkest moments with the reader. Greenwood blatantly acknowledges in one of the poems that she found her voice through her writing, and that writing is the catalyst for her taking her first steps towards recovery. I like Greenwood’s openness and honestly in this collection, and her willingness to share so much of herself with the reader. However, for me, this is also one of the collection’s weaknesses. In poetry, there is so much said in what is left unsaid, and Greenwood leaves very little unsaid. She is so eager for the reader to know precisely what she went through, that her poetry focuses on constructing complete pictures of the specific incidents she chooses to retell. While it is clear that her intention is to show the reader exactly what she went through, it feels overdone for the poetry genre. Poems are supposed to construct a moment using only as much language as necessary, leading the reader space to fill in the gas for themselves. Even so, there are a few diamonds scattered throughout the collection, and these shine through in Greenwood’s shorter poems. In the poem “Sanctuary”, Greenwood constructs a wonderful moment in only four lines, telling as much of a story as she does with some of her two page poems. Each word carries its weight to construct a single, devastating moment, allowing the reader to read between the lines and unravel the meaning for themselves. Yet nothing can take away from the insight Greenwood gives her reader into the vicious cycle of abusive relationships. It is a confronting read. I am fortunate enough to never have experienced such a relationship, and while reading, I found myself gaining more understanding as to why she couldn’t simply leave the relationship at the first sign of trouble. It is more complicated than “just leaving”, and with the wisdom of hindsight, Greenwood indicates that now she can clearly see the signs she refused to see back then. Greenwood’s courage is undeniable. She is not afraid to stand up to her partner, to a certain point, despite knowing what the consequences will be, and she fights and fights to try and protect her children and shelter them from the violence. And, when she finally realises she needs to leave, if not for her own sake then for her children’s, she does. Despite the horrible abuse Greenwood is victim to, she ultimately removes herself and her children from their perilous predicament and proceeds to get their lives back on track. The collection shows just how difficult and painful it is to recover from something as demeaning and demoralising as an abusive relationship. There are times when Greenwood feels like she isn’t worth the ground she walks on and seriously considers ending it all, yet each time, something stops her from going that far. The poems recount good days and bad days, slowly turning from hopelessness and despair to glimmers of hope and excitement for the future. Stepping into the Sunshine shares the story of one woman’s journey from the dark days of abuse to her first shaky steps towards a brighter future. While many of the poems felt wordy and overwritten, there are some wonderful, shorter pieces scattered throughout the collection. Yet this book is more about the story as a whole than each individual poem. Greenwood beautifully orchestrates her life journey through her poetry, allowing the reader a sneak peek into her trials and triumphs, through the days when seeing the sunshine is impossible, to embracing and celebrating herself, and the sunny days which are yet to come. Stepping into the Sunshine is published by Footsteps Press. This entry was posted in Arts, Books and tagged book review, books, domestic abuse, Grace Greenwood, lip lit, literature, poetry, Review, Stepping into the Sunshine, verse. Bookmark the permalink.